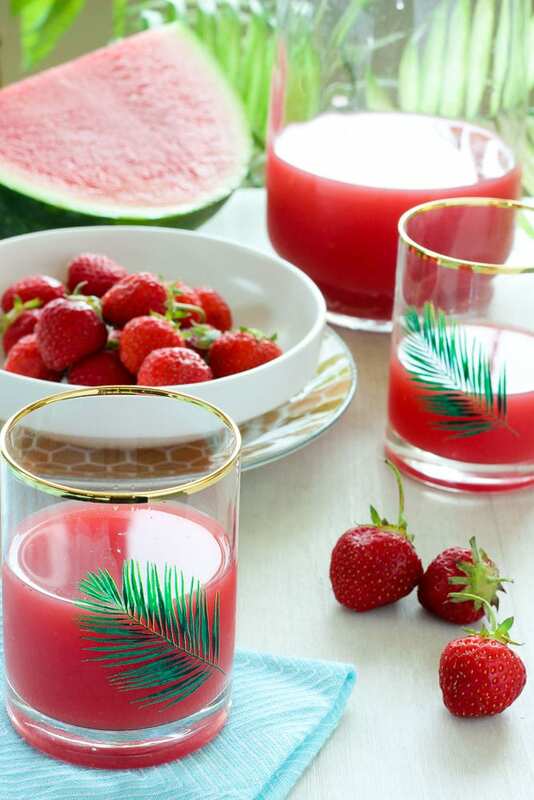 This Strawberry Watermelon Punch will be your favourite summer drink! Perfect for brunch, picnics or summer parties – you can make it alcoholic or non-alcoholic – so it’s great for kids too! It’s easy to make and super refreshing! Did you go crazy and buy too many watermelons and strawberries on a super summer sale? Or just find yourself with leftover watermelon and berries that you’re not eating fast enough? This Strawberry Watermelon Punch recipe is for you. After all, what fruits embody the taste of summer more than watermelon and strawberries? 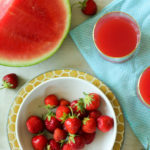 This fruity, refreshing punch (or juice, if you prefer) is also the jumping off point of SO many other delicious summer treats. Take a few minutes to mix some up to go with lunch or dinner, or bookmark this recipe for a special occasion – it’s a perfect place to start any party punch, baby shower punch, or even wedding punch! You can make this alcoholic or non-alcoholic to suit the occasion. 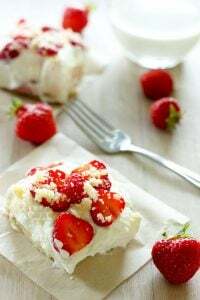 It’s perfect for kids or adults and it’s cheap enough that you can make a big batch for a special occasion (as long as you’re making it in the summer). It’s also super simple to make, and you can make it ahead of time! You can even serve it in a watermelon punch bowl, if you want! I’ll have lots of recipe variations and ideas below. Tip: If you’re making this punch to drink soon, you can pour the simple syrup into another dish and add an ice cube or two to it. This will cool it down quickly, while you do the rest of your steps. Cut or scoop 3-4 cups of watermelon flesh away from the peeling and wash and hull around 1 heaping cup of fresh strawberries. Put them in the bowl of a fruit processor and process for a few minutes, until smooth. 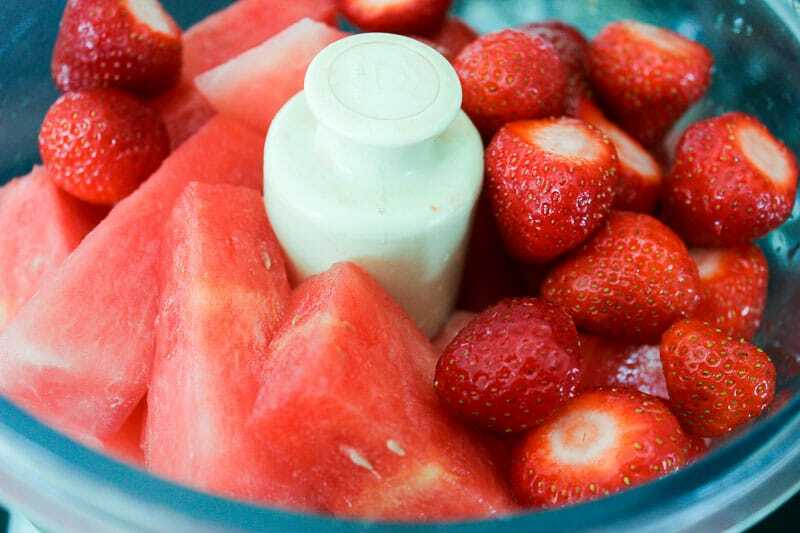 Tip: This ratio is heavier on the watermelon and lighter on the strawberries. 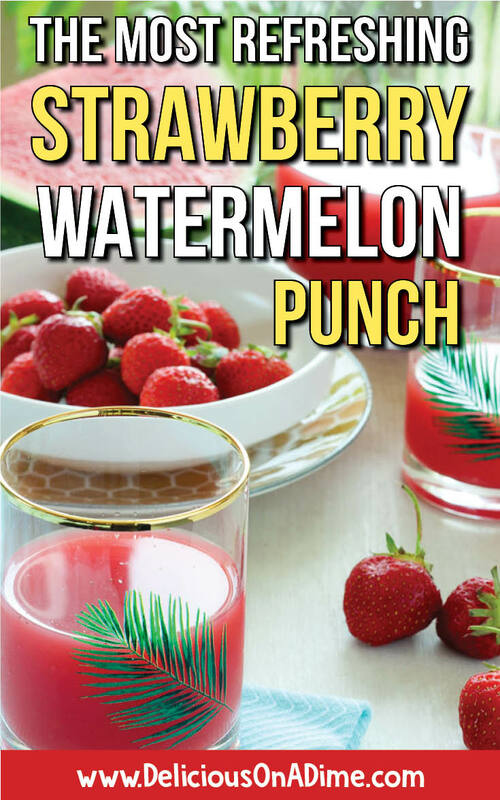 If you really love strawberries or prefer punch with a bit more “punch” (hehe) than watermelon typically has, feel free to adjust the ratios. 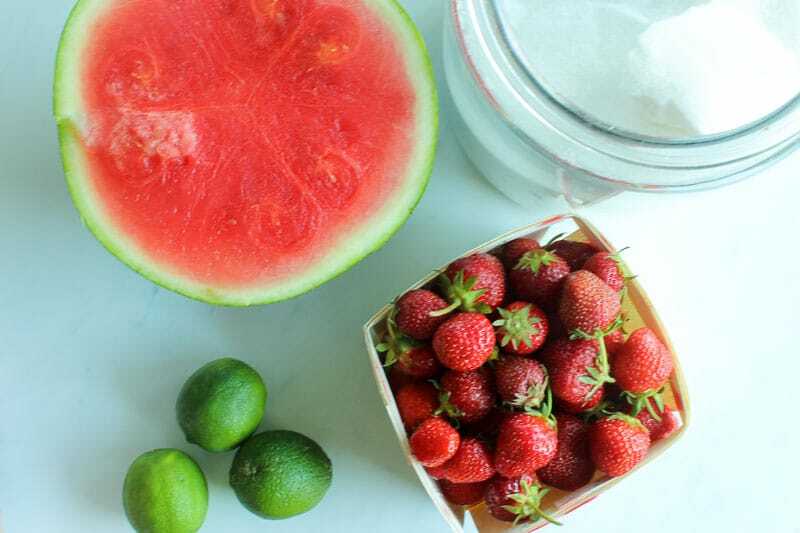 You could try equal amounts of each fruit – but you might need to add a little more liquid to the finished product to water it down (watermelon is quite watery). 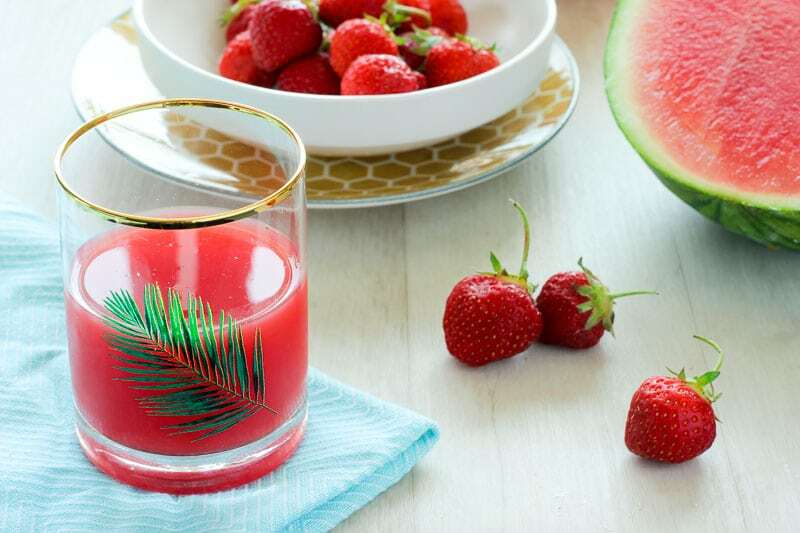 Tip: If you’re making this to drink soon, make sure your watermelon and strawberries are refrigerated ahead of time, so that the final product needs less chilling. 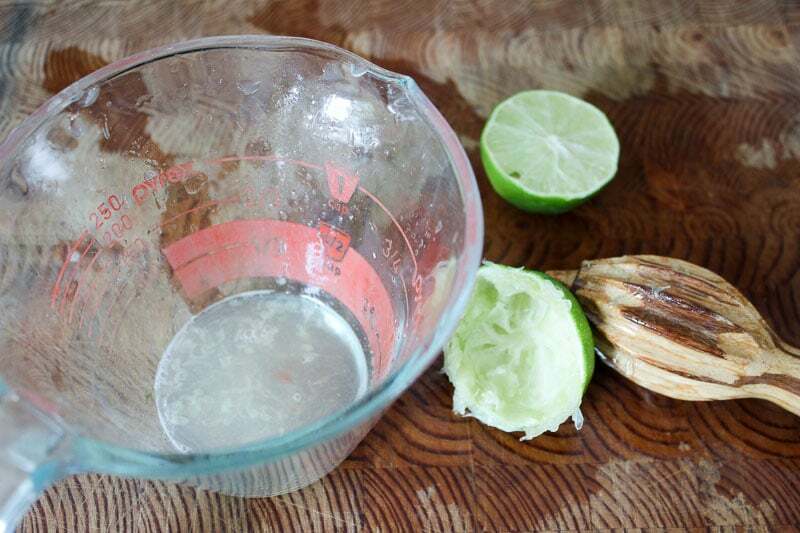 Add 3 tablespoons of fresh lime juice (my lime was very juicy, so it only took one – but if your limes are dryer it might take more). Tip: Microwave each lime (this also works for lemons) for 15 seconds before cutting and juicing, and it will yield more juice. Tip: If you strain your juice, use the pulp in a smoothie – it’s delicious! Yum! Drink the punch as is, or mix it up! See lots of options for add-ins and different types of mixes below! What kind of alcohol can I add to this to make it an alcoholic punch? You have SO many great options here! If you want to make rum punch, I would add white rum, or you could give coconut rum a try for a more tropical twist. 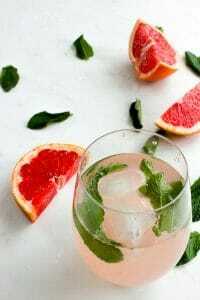 If you want to make vodka punch, you could use regular vodka, but flavoured vodka would also be super delicious – I’m thinking lime, a citrus, or even watermelon (to bump up the watermelon flavour). For a sparkling punch you could add Prosecco or any other sparkling wine (champagne brunch anyone?). If you do this I would only add the sparkling wine when you serve it, so the bubbles don’t dissipate. I also think peach schnapps would be delicious. Or you could muddle some fresh mint leaves and extra lime in a glass and use this punch (and some rum) to make a strawberry watermelon mojito. Or blend with tequila and ice to make a strawberry watermelon margarita. YUM! What if I want to have non-alcoholic punch? Whether you want to make punch for kids or are looking for a non-alcoholic drink for adults, you can definitely serve the punch as is – it’s delicious. Or, omit the extra cup of water and serve with club soda, sprite, sparkling water, pineapple juice or lemonade. Again, if you’re adding a carbonated beverage I would add it just before serving. You can also leave out the sugar and have detox water. Can I use this to make a smoothie? Yes. Omit the water (at the end) and blend with coconut milk, yogurt or other smoothie add-ins that you love! 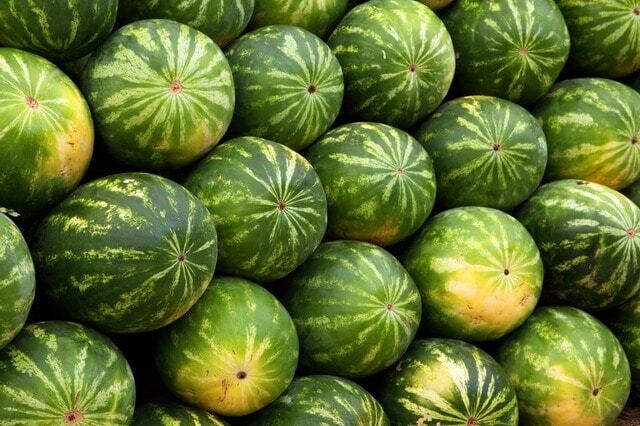 How can I pick the best watermelon? I’ve read a lot of tips over the years about this, but two were particularly helpful and easy to remember. 1. Look for a watermelon that has a large yellow/light brown spot on it. I used to think this was a bad thing, but apparently it means that the watermelon ripened in the field, instead of being picked too early. Since I started choosing these watermelons I truly don’t think I’ve had a bad one! 2. If you’re looking for a juicy watermelon, pick one that is heavy for its size. A few weeks ago I bought one and I honestly couldn’t believe how heavy it was! I think it was the juiciest watermelon I’ve ever eaten! How can I pick the best strawberries? First, check to make sure there are no overripe, mushy or moldy strawberries in your basket. Then, close your eyes and take a big sniff of the strawberries! Your sense of smell will be the best guide to how good they’ll taste! If they smell like gorgeous, fragrant summer strawberries, they’re probably going to be delicious. If you can barely smell them at all, I might skip them because they probably won’t have much taste! Yes. Just thaw them first to keep the rest of the recipe steps the same. Did you make this Strawberry Watermelon Punch? Leave us a star rating below! This Strawberry Watermelon Punch will be your favourite summer drink! Perfect for brunch, picnics or summer parties - you can make it alcoholic or non-alcoholic - so it's great for kids too! It's easy to make and super refreshing! 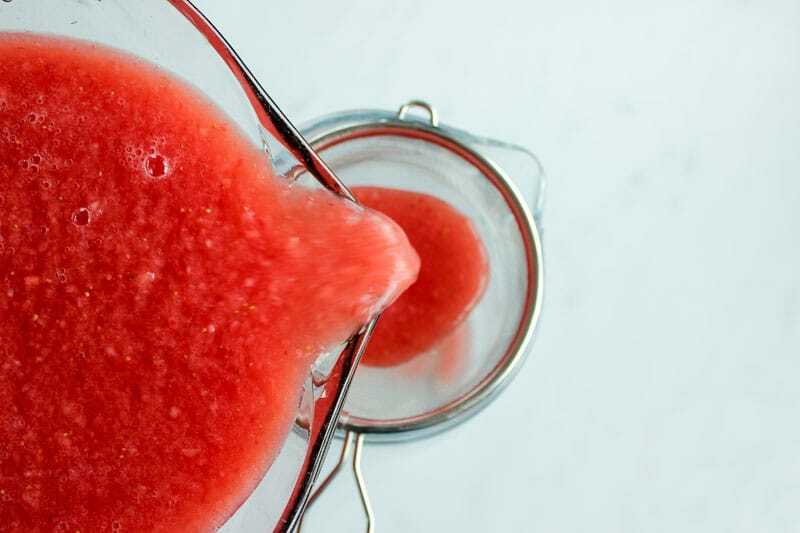 In a food processor, puree watermelon and strawberries until smooth. Juice limes*** and add lime juice to the fruit puree. (Optional Step) If you want a non-pulpy juice to work with, strain it through a fine sieve, using a spatula to push it through. Save the solids for a smoothie. Put strawberry watermelon juice in a pitcher and add simple syrup to taste. I used 1/4 cup but it will depend how sweet your fruit is. Chill. 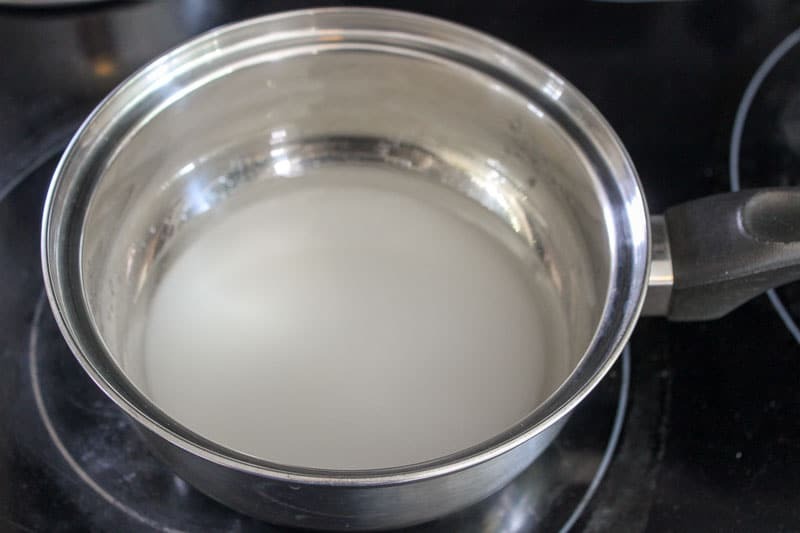 Before you serve, add either 1 cup of filtered water or one of the add-ins listed in the notes. *See Questions and Answers above for detailed add-in suggestions. 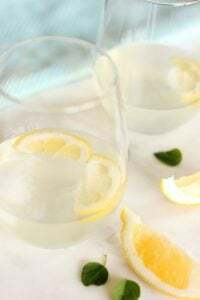 You can use club soda, sprite, lemonade, vodka, rum, Prosecco or other sparkling wine, and more! **To cool quickly, pour the simple syrup into another dish and add an ice cube or two. ***Microwave each lime for 15 seconds before cutting it open and it will yield more juice.